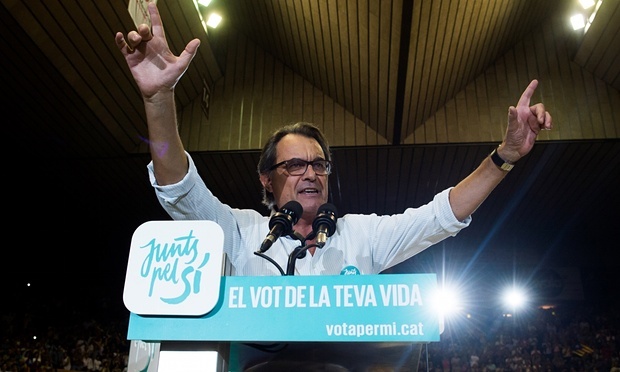 Quote: "If his separatist party wins a majority of the seats on Sunday, the Catalan president, Artur Mas, has vowed to lead a transitional government that would begin the process of creating an independent state, with a mandate to declare independence by 2017. Lasting no longer than 18 months, his government would be guided by the steps outlined in the Junts pel Sí party’s 125-page electoral programme. The first would be a declaration, made within days of taking office, proclaiming the beginning of the process to break away from Spain. From there, Mas said his priority would be to sit down with Madrid and the European institutions “to talk and to negotiate and to reach agreements”. The focus of the talks will be on addressing issues such as the management of shared borders, the energy grid and the Ebro river basin. If Madrid refuses talks with the region, Mas said that Catalonia could retaliate by walking away from its share of the public debt, accounting for roughly a third of Spain’s total debt. Mas’s government also plans to begin drafting a constitution for Catalonia, hoping to draw on citizen participation to inform its content. Plans for the first of these new state structures, a regional tax agency modelled on that of Sweden and Australia, was halted by Spain’s constitutional court earlier this month after the court agreed to hear a challenge lodged by the central government in Madrid. The same fate could befall many of the state structures envisioned by Mas. With just days left before polling, the Spanish prime minister, Mariano Rajoy, said Madrid would use the full power of the judiciary to block any move towards Catalan independence. “We would go to the constitutional court. And that’s the way it is. Full stop,” he told broadcaster Onda Cero. Spain’s governing People’s party (PP) recently introduced an urgent reform giving the country’s constitutional court the power to sanction elected officials and civil servants who fail to comply with its rulings with fines of up to €30,000 (£22,000) and suspensions. As the bill was presented before the country’s lawmakers, Xavier García Albiol, the PP leader in Catalonia, left little doubt that it was aimed at quelling Catalan separatism. “This is a very clear message for those who want to break up Spain: the joke is over,” he said. The PP is expected to flex its absolute majority in parliament to have the bill approved in the days following the Catalan elections. And, with a clear result having emerged, we’ll close this liveblog. That clear result? Catalonia has handed a clear majority to parties actively seeking the region’s secession from Spain. Nevertheless, independence remains a distant prospect. An agreement will have to be reached between the two main pro-independence parties in order to secure that absolute majority and the central government in Madrid has promised to fight tooth and nail to prevent secession. The impact of this result on Spain’s general election, which is due to take place at the end of the year, will be interesting to see. Q: How and why did the vote come about? A: Catalonia has, for centuries, treasured its own language and culture. But, during Franco’s dictatorship, its language was banned. The recent surge in independence sentiment stems from June 2010, when Spain’s highest court struck down key parts of a charter that would have granted Catalonia more autonomy and recognised it as a nation within Spain. A: The pro-independence leader Artur Mas has claimed victory as separatists has won a parliamentary majority. However, opponents say pro-independence parties did not get more than 50% of the votes. Q: What does Spain’s government think? A: Prime minister Mariano Rajoy’s government has made it clear it will use all legal methods to prevent the independence of Catalonia, which accounts for nearly a fifth of Spain’s economic output. A: With both sides claiming some form of victory, moves to declare independence will be opposed. Months of negotiations are likely.